This entry was posted in Newspapers, SLWA collections, SLWA news, SLWA services, State Library of Western Australia, WA history, Western Australia and tagged ANDP, archive, Australian, Australian Newspapers, Australian Newspapers digitisation program, database, databases, digital, digital archive, digitised, digitised newspapers and more, digitized, information services, library, newspaper, newspapers, slwa, State Library of Western Australia, The West Australian, TROVE, west, West Australian, Western Australia by BusLib. Bookmark the permalink. Is it possible to view a copy of the West Australian on the 29th November 1999 ? Hi Costa, sorry about the delay in responding, I’ve been on leave. 1999 issues are not yet available digitally – from 2004 issues are available in libraries that subscribe to “The West Australian Digital Archive”. Issues up to 1954 are freely available on the “Digitised Newspapers and More” (formerly “Austrlian Newspapers”)section of Trove. See: http://www.trove.nla.gov.au/ndp/del/title/30 Later issues (i.e. 1955-2003) are available on microfilm – you can visit a library that holds the microfilm (e.g. State Library of WA) or you may be able to request the microfilm on interlibrary loan – enquire at your local library. Hi , I was wondering if it’s possible to get a copy of The West Australian , or even the front page headlines of the issue printed 14/9/1956? Hi Rhonda, apologies for the delay in responding, I’ve been on leave. If you check out my response to Costa you will see that the issues between 1955 and June 2003 are only available on microfilm. You will need to visit the State Library of WA to see them and copy them yourself or you will need to request a copy on inter library loan through your local library. If you have further queries please use the Library’s Ask A Librarian service (linked from our homepage at http://www.slwa.wa.gov.au). Hi Peter, Unfortunately, as you can see from my previous comment this issue isn’t digitsed. Also copyright law prevents us from just sending you a copy… you’ll need to arrange copy through your own library’s inter-library-loan or document delivery services. All the best with this! I wanted to obtain a copy of The West magazine on Saturday 22 Nov 2008. The West Aust archives does not have the West magazine. Do you know where I can get a copy? Hi Sue, that issue should be available on microfilm – http://catalogue.slwa.wa.gov.au/record=b2815377~S2 . You can visit us to look at it. If you aren’t able to visit us you should be able to request either a copy of the article you want or borrow the microfilm for viewing (depending on the services available at your library. Ridiculous! Nothing between early-1900s and 2004? Get with the program! 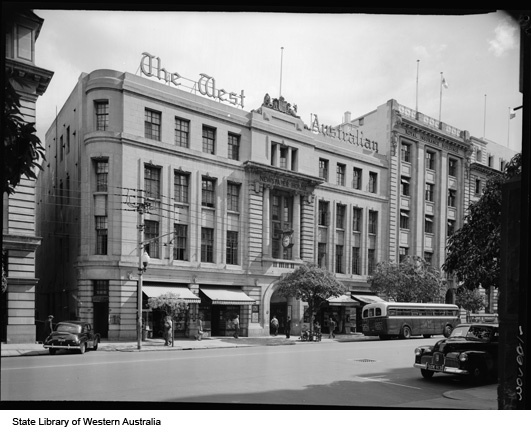 Hi Mark, if you read back through the comments on this post you’ll see that “The West” is available online via Trove http://www.trove.nla.gov.au/ndp/del/title/30 up to and including 1954. Issues between 1955 and 2003 are available on microfilm from the State Library. Currently copyright prevents us from making these later issues available digitally. How can I do this on the computor? Hi Jan, currently you will need to come into the State Library to view these either online or in print. We are making many of our e-resources available to State Library members from home http://www.slwa.wa.gov.au/find/e-resources , however this one is not yet available. If you are not in Western Australia you will need to speak to your local or State Library for assistance. I kept a copy but now cant find it. Is it possible to find the article? I need information and details of your paper’s report on the 20/07/1974 regarding a so called pirate Black Jack Anderson in the Albany area in the 19th Century,I am doing research for my book about this Character. Good luck with your book – I’ve been to Black Jack Anderson’s hangout on Middle Island in the Recherche archipelago, it’s a wild and beautiful place! looking for news on Jerzy Tomiak in the year 1975 do not remember exact date. Hi Leszek, As I’ve already mentioned here “Issues [of “The West Australian”] between 1955 and 2003 are available on microfilm from the State Library. Currently copyright prevents us from making these later issues available digitally”. If you wish for help searching “The West” or any other of our library resources please use our information services – http://www.liswa.wa.gov.au/find/services/information_services . If you are trying to find a lost relative you could try the Salvation Army Family Tracing Service http://www.salvationarmy.org.au/familytracing/ or the Red Cross http://www.redcross.org.au/ourservices_aroundtheworld_tracingrefugeeservices_default.htm. Good luck with your search! I am looking for death notices 8-13th march 2004 West Australian Newspaper, can anyone help me I live in Queensland. hello, where would i find any information ( if their was anything printed in the newspapers) about me fathers drowning on new years day 1972 at lake leschenaultia, near chidlow, thankyou. Hi am looking for an article on my Father John (Jacko) Hutchins, he was suppose to go to Singapore for the 1950s Commonwealth games for Boxing. He came off his Motor bike in North Fremantle. There was an articel in the paper of him in hopsital with my Mother Margaret Hutchins nee Nunn. Are you able to help me fins this information?? Looking for death notice of Wayne Robert Hughes – born in Fremantle in 1953. Parents Lesley Mervin Hughes and Peggy Amelia Crouch. Hi Coral, Where to search will depend on when Mr Hughes died. Issues of “The West” between 1955 and 2003 are available on microfilm in the State Library. Currently copyright prevents us from making these later issues available digitally. (Issues between July 2004 and yesterday are available in an online archive – http://catalogue.slwa.wa.gov.au/record=e1001654~S2 – to State Library members, in the State Library building). If you can’t visit the library to search “The West” or need further assistance with this query please contact our information services – http://www.liswa.wa.gov.au/find/services/information_services Good luck with your searching. Hi Coral, if you are ever tracking your wider Hughes family, I can help. Lesley had brothers/sisters in Leonard, Herbert, Joyce and Lorna I believe. Im looking for a photo of Kevin Sheedy & James Hird holding the Premiership Cup from the 1993 AFL Grand Final. Would this be available??? Sorry. Got confused. Looking for photo of Bomber Thompson & Kevin Sheedy holding 1993 Cup AND photo of Kevin Sheedy & James Hird holding 2000 Premiership Cup? How would I locate these? I’m sure they would have been in paper. Thankyou for your kind words about our site. I’ll pass the information about browser compatibility issues on to our IT people. With regards to the “copyright issues” relating to the 1955-2003 period, are attempts being made to try and resolve, or is this expected to take many years to try and overcome? I’m just trying to judge whether to wait and after an update on progress in this regard. Hi Rochelle, newspapers prior to the mid 1950s are out of copyright so have been digitised under the national “Newspaper Digitisation Programme” (see http://www.nla.gov.au/content/newspaper-digitisation-program). Later issues are still in copyright so we don’t have the right to digitise them. Alas I would be speculating if I attempted to suggest when these issues may be available digitally. Consequently if you need access to articles from 1955 to 2003 I suggest you use our microfilm or contact our information services (http://www.liswa.wa.gov.au/find/services/information_services) for assistance. I am in Sydney and wanting to find an article in the West Australian by Helen McNee on disability, somewhere between the years 1968 and 1990. Is it possible to search online? If not, can one do a electronic search at the Battye Library, rather than looking through all those issues? Hi Roobark, as it says in the above post, “if you need information from issues between 1955 and 2003 they are available on microfilm (along with earlier and later editions that are also in the online services), you can view the microfilm at the State Library. and a librarian will respond to your query. Thanks for the comment Paul, were you looking on the microfilm? If not, then it’s not quite so strange… Issues between 1955 and 2003 are available on microfilm (along with earlier and later editions that are also in the online services), you can view the microfilm at the State Library. The West Australian Archive Digital Editions database covers all issues of the newspaper from July 2004 until yesterday. If you need help finding information from The West or if you are unable to visit the State Library to use the database or microfilm please contact the State Library’s information services (http://slwa.wa.gov.au/find/services/information_services). Can you tell me if and when the next set of the Western Australian Newspaper will be digitalised and what years it will cover. Thank you for your query. Under copyright law we do not have the right to digitise recent copies of The West ourselves. We purchase access to the West Australian Archive Digital Editions database (2004 to yesterday) and the coverage is selected by the publisher, if you wish you may contact them on WAN_Archive@smedia.com.au to see if they plan to expand their coverage. Historic issues of the paper (available on Trove) were digitised under the national Australian Newspapers Digitisation Programme (http://www.nla.gov.au/content/newspaper-digitisation-program) which covers “newspapers published in each state and territory from the 1800s to the mid-1950s, when copyright applies”. As mentioned in the blog post the intervening years are available at the State Library on microfilm. Sorry this took a couple of days to respond to, I wasn’t at work yesterday. Thanks for the query Fiona. The best way to get what you require is to come in to the library and access them yourself. However if this is not possible for you (you don’t say where you are located) then please contact the State Library’s information services (http://slwa.wa.gov.au/find/services/information_services) for assistance. Apologies for not responding sooner, I was not at work yesterday. Apologies Leszek for the late reply, I’ve been on leave. The best way to find what you require is to come in to the library and enquire in person. However if this is not possible for you (you don’t say where you are located) then please contact the State Library’s information services (http://slwa.wa.gov.au/find/services/information_services) for assistance. Oops, Michael, apologies for the typo in your name on the reply. Why is it that all the text is jumbled up for the death notices and the page images can not be enlarged to a readable format? Hi, thanks for the comment. To follow this up please contact our Information Services via our Ask A Librarian form: http://yourenquiryservice.slwa.wa.gov.au/reft100.aspx?key=YES_Client . Please indicate which device (PC, tablet, etc) you are using to access the West Australian Digital Archive, the details of the problem and the date of the issue you are having problems with. The query will be assigned to a colleague who has the skills to help you. Hi there. I am looking to find how I may go about getting a picture from the newspaper Daily News in Perth. I have the original newspaper front page with the article on the back side. The newspaper was on March 26 1959. The article was headlined: They’re jumping for joy – and this is why. It’s of three sailors getting off the ship Boonaroo in Fremantle after they had just found out they won first prize in Tattslotto. Hi Warren, thank you for your enquiry. Our reference staff should be able to help you. How can I view a death notice in The West Australian March 2004? I read the digitised eresource commences from July 2004. I have found my adopted mother lives in maddington. And yesterday i found my sister i have never met was michelle robson who died at home on this day 8 years ago. I was hoping you might have some information about her. Pingback: Making Engineering Design Ecologically sustainable. – Greenhouse Gas Emissions. Who Are The Culprits? I was wondering if anything has changed regarding the availability of the Western Australian Newspaper in digitised format between the years of 1955 – 2003.
funding to purchase the copyright? Sorry Simon, you are quite correct that digital access to the non-digitised years of The West is out of our control (under the Federal Copyright Act of 1968 (and its later amendments). It’s a big commercial publication (and there may be many rights holder involved) so purchasing the rights is unlikely to be feasible for us.